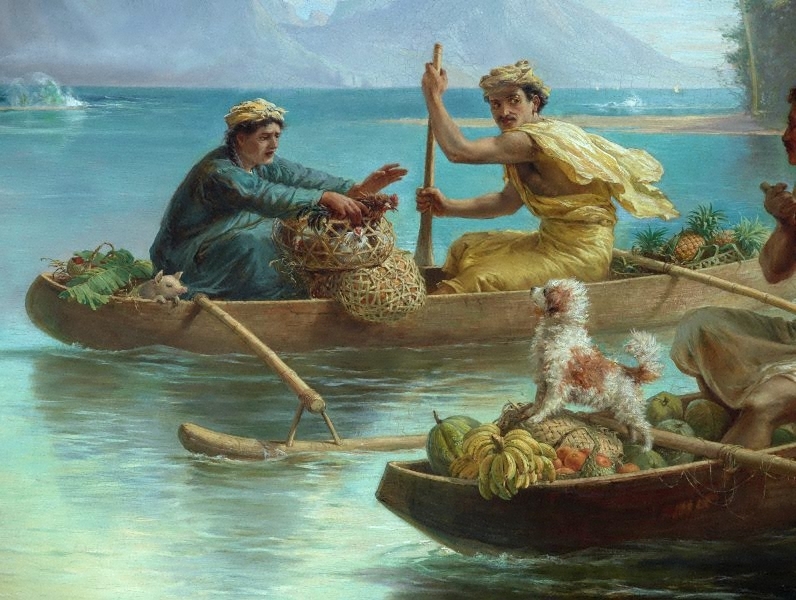 Born in Russia, Nicholas Chevalier arrived in Melbourne in 1855 during the gold rush, becoming an illustrator for Melbourne Punch and exploring different parts of the region with his friend Eugene von Guérard. Ten years later Chevalier moved to New Zealand. 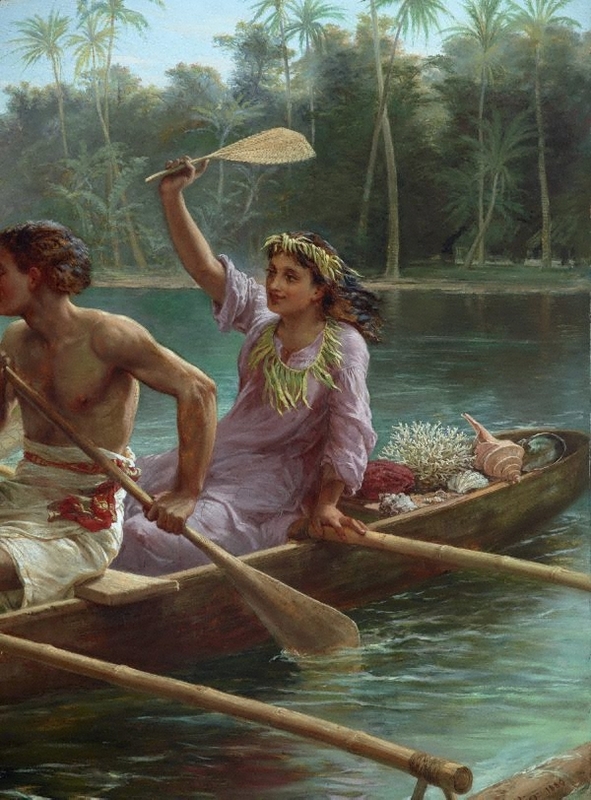 In 1869 he joined the HMS Galatea as an artist with the Duke of Edinburgh on the voyage to the East and back to London with stops including Tahiti. He remained in London for the rest of his life. 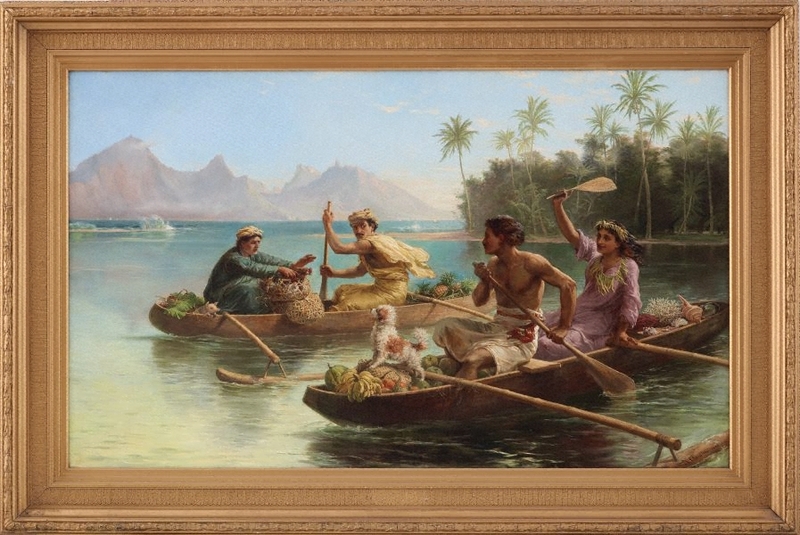 'Race to the market, Tahiti' was produced from that tour, painted from sketches made at Opunohu Bay. 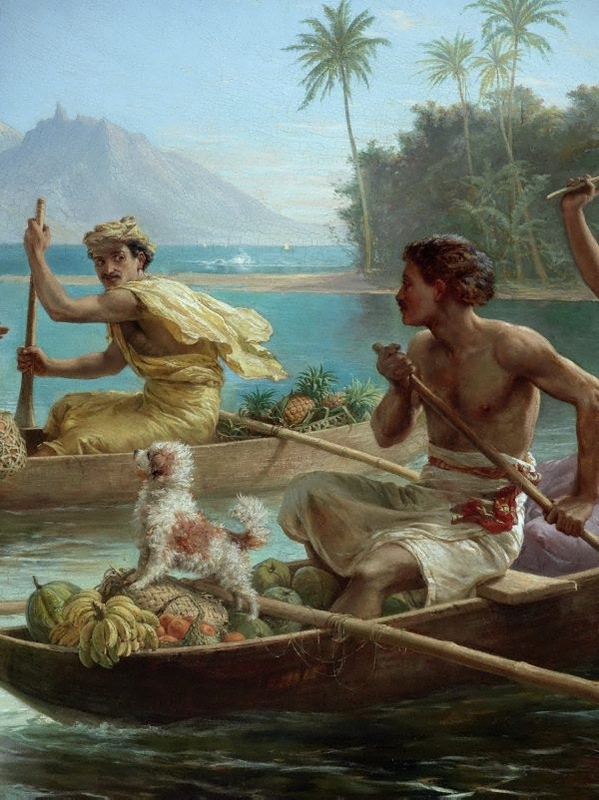 The central focus of the composition is Chevalier’s dog, Tuppenny, which figures in many of the artist’s Pacific paintings. Signed and dated l.r., black oil "N. Chevalier 1880". Bonhams Australia, Australian & International fine art: Monday 22 August 2011 Sydney , Sydney, 2011, 68 (colour illus.). 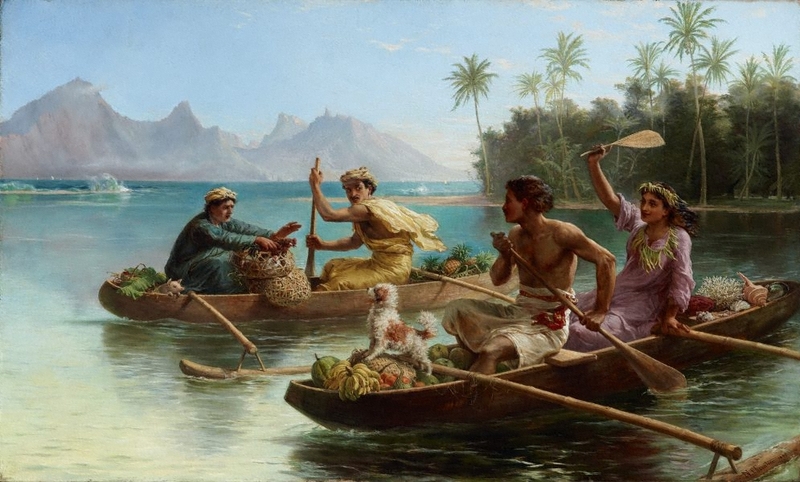 RELATED WORK: lot no 32, 'Arcadia, South Sea Islands' 1882. This work is illustrated on page 68. Steven Miller, Look , 'A dog's life', pg. 18-19, Sydney, Dec 2015-Jan 2016, 18, 19 (colour illus.). Steven Miller, Dogs in Australian art , 'Löwchen', pg. 140-141, Kent Town, 2012, 140 (colour illus.). Diedrith Newkomer., Illustrated Sydney news , 'Sydney Art Gallery', Sydney, 20 May 1887, page unknown. Jill Sykes, Look , 'WOOF! WOOF! Australian art history gone to the dogs', pg. 34-35, Sydney, Mar 2010, 35. Look , Sydney, Nov 2009, 48 (colour illus.). 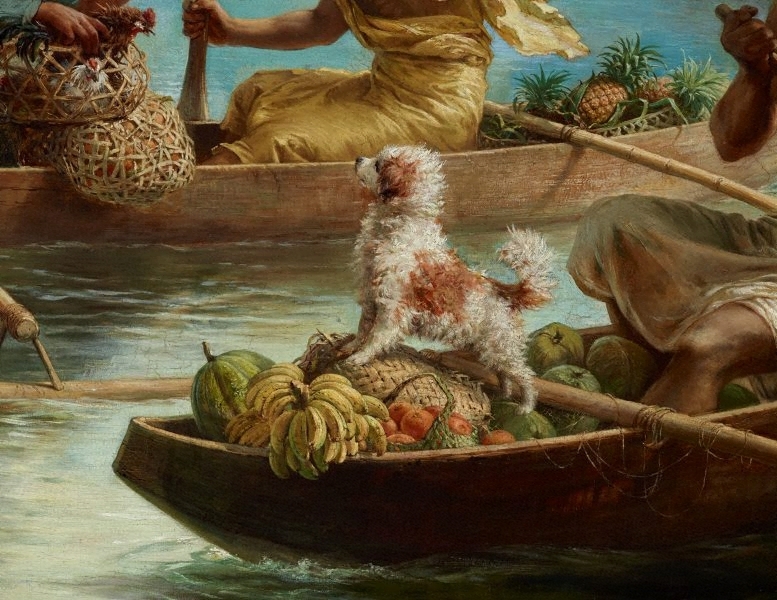 Members events section highlighting Steven Miller's forthcoming lecture on dogs in art. Bonhams, London, Exploration and travel: Wednesday 15 September 2010 , London, Sep 2010, 2 (colour illus. ), 12 (colour illus. ), 13 (colour illus.). RELATED WORK: lot no. 12, 'Arcadia, South Seas Islands' 1882. This work is illustrated on page 2 and page 13. Editor Unknown (Editor), Sydney mail and New South Wales advertiser , Sydney, 09 Jul 1881. 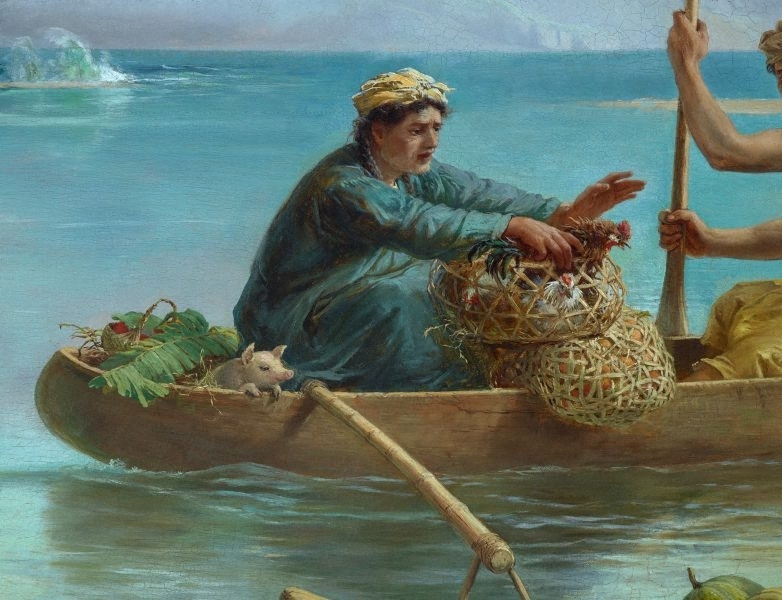 Bonhams: Australian & International Fine Art, Monday 22 August 2011, Sydney , Catalogue entry for Lot 32 Nicholas Chevalier 'Arcadia, South Sea Islands', pg. 68-69, Sydney, 2011, 68.